"mommy, i made da play room perdy!" 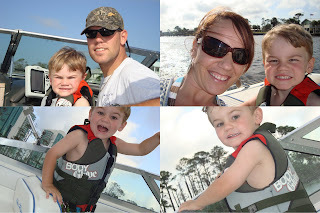 we recently got a new boat and i don't have a picture of it, but this is a few shots of the two boat rides that we've enjoyed in the past week. i know ya'll are probably thinking, you're pregnant and not supposed to be on a boat. i promise we're not jumping waves in the gulf of mexico, we just cruise around at pretty much idle speed and just enjoy the "slow" ride. i actually think i'm probably bumped around riding in the car more than a boat. brady cole loves it and we've been enjoying so far. 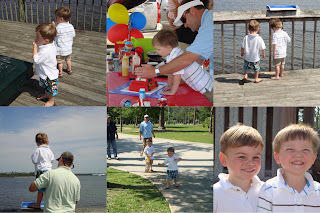 this past saturday, we enjoyed bc's buddy caden's b'day party at the waterfront park. it was nice and they really had a good time. they enjoyed feeding the seagulls the bread off of the pier and i'm sure the fish enjoyed it too. brady cole and caden are really big buddies and have been to school together since brady cole was 9 mths. caden recently moved up into the 3 yr old class and brady cole has not been doing well with the change. he was crying every day, but he's doing better now. he starts moving up to that room on may the 19th, so not too much longer. i don't know if we'll ever be able to seperate these two for long. this afternoon, everyone came to our house for some good bbq and more egg huntin'. 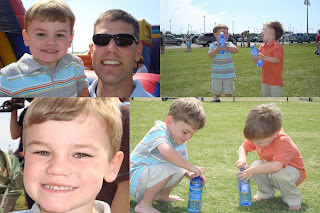 letson and brady cole loved finding those easter eggs. letson beat brady cole in the number of eggs b/c if brady cole couldn't shake the egg and hear coins rattle in it, he didn't want it. what a stinker? and speaking of bbq, can you tell who snuck up on the table and ate her brothers and little cousins food when we weren't looking? yep, that's my little girl. looks like she enjoyed it too!!!! after church this morning we took a couple of pictures before we all changed clothes. in the first two you can tell that somebody was not in the mood for pictures at the moment.i think he just didn't want to stand still long enough. he was so wired up on sugar and had alreay eaten tons of starburst and starburst jelly beans by 11:00. i thinks that's why it took him almost 2 hrs after laying down for a nap to actually fall asleep. the easter bunny dropped of brady cole some goodies at our house after making a big mess over all his carrots that we left him on our front sidewalk. brady cole got him a new beach bag filled with a new swimsuit, swim shoes, new spring/summer clothes, sand toys and a little bit of candy. i think he's all ready for the beach now. 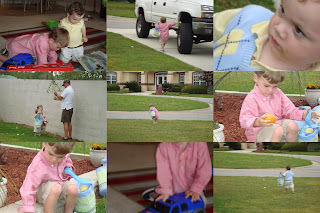 the easter bunny even stopped off at yai yai and pawpaw's and dropped off even more goodies, but it was a wagon for the beach that will be perfect to put all his stuff in and pull out to the sand. grandaddy came down and spent the wk/end, so after our egg hunt yesterday morning, we went to the strawberry festival in loxley. it was a beautiful day to be outside and enjoy the weather, so we just walked around and checked everything out. they also had rides and games for the kiddies and the top picture shows buger and brady cole having a little fun on the "fun slide." 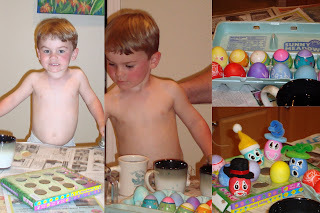 last night we enjoyed dying some easter eggs. 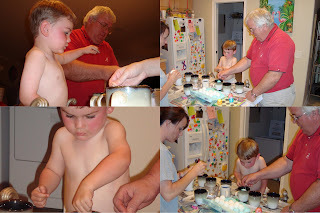 brady cole was all into dying the eggs and was a complete mess when we were done. i really had to do some good scrubing on him in the tub last night. saturday morning we started our day out by hunting easter eggs. brady cole and his little buddy caden had a great time. as you can tell, there were more than enough eggs to go around. 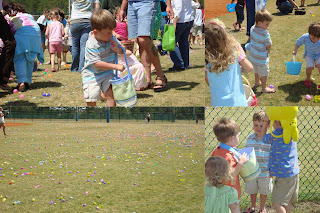 they had softball fields filled up with eggs everywhere. they had fields for different age groups and there were kids everywhere. lots of fun!!!!!! here are a couple of pictures of this precious little niece of mine...don't you think? i know some of you are very anxious for pictures....so here you go. she was born this morning at 8:35 and is doing very well and so are mom, dad and letson. she looks bigger than 6 lbs 12oz too. she's adorable and might favor her brother a little bit, but not too much. she definitely looks like a little girl. i'll try to post some more pictures tomorrow afternoon. staci, trevor and staci's buddy sarah were down for a visit last wk/end. of course i didn't get any pictures to prove it, but staci did take this picture of me and my buddy while we were having dinner friday night at cosmo's. we had a little family outing yesterday to pensacola to do a little shopping a quick trip to chuck e cheese for some pizza and games.